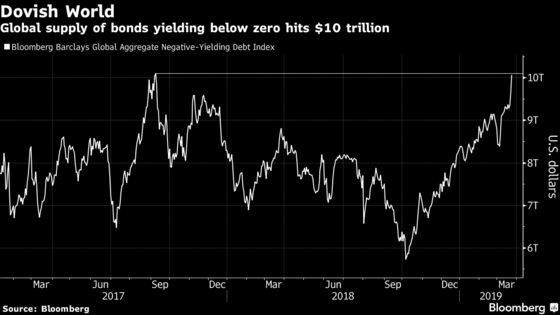 (Bloomberg) -- The stockpile of global bonds with below-zero yields just hit $10 trillion -- intensifying the conundrum for investors hungry for returns while fretting the brewing economic slowdown. A Bloomberg index tracking negative-yielding debt has reached the highest level since September 2017 as 10-year bunds trade in negative territory and the U.S. yield curve flashes recession warnings. With central banks in dovish mode, money managers face increasing pressure to reprise the yield-chasing mentality synonymous with quantitative easing, according to Gary Kirk, a founding partner at London-based TwentyFour Asset Management with $19 billion overall. Kirk is “resisting the temptation” to snap up longer-dated credit obligations that could succumb to defaults in a downturn and prefers duration bets in interest-rate markets. Fund flows underscore the lust for yield in the low-rate, lowflation climate. Investors in the week through March 20 parked $6.6 billion into investment-grade funds, $3.2 billion into high-yield bonds and $1.2 billion into emerging-market debt, according to a Bank of America Corp. note citing EPFR data.